Tedi, for ontoTerminology EDItor, is a software environment dedicated to building multilingual ontoterminology (an ontoterminology is a terminology whose conceptual system is a formal ontology).Tedi allows to define the formal ontology and the set of terms in the different languages independently of each other. The different set of terms are linked through the shared ontology. Tedi offers a set of tools for building ontologies and the lists of terms. It also allows objects and proper names editing as well as export in different exchange formats (RDF, HTML, SKOS, JSON). Based on essential and descriptive characteristics, Tedi provides epistemological guidelines (Aristotelian principles) for building a consistent conceptual system (logical properties are verified during the ontology building process). For example in specifying new generic concepts, only valid concepts are proposed by Tedi. 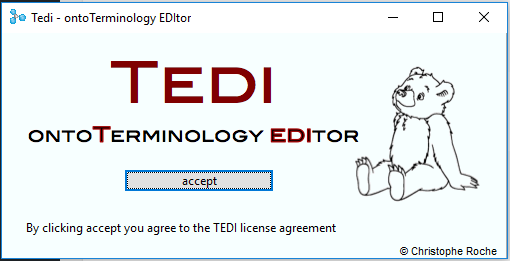 The lists of terms are defined independently of each other in each language using the Tedi Term-List editor. The lists of terms are automatically put into relation due to the common ontology. Based on the fact that a term denotes a concept, we can define equivalence in terminology and synonymy in terminology when two terms denote the same concept. Under such a condition, Tedi automaticaly calculates the terminological equivalents and the terminological synonyms. Ontoterminologies can be exported in OTE (OntoTerminology Exchange), RDF/OWL, SKOS, JSON, and HTML.